Pictured are two photographs by Ohio Wesleyan University graduate Stephen Donaldson. A number of Donaldson’s photographs are currently on display in the Mowry Alumni Center at OWU. Stephen Donaldson’s time at Ohio Wesleyan University kicked off a career in photography that can be described as nothing short of a journey. Next weekend, he will return to Delaware for his 35th class reunion at OWU, where his “Blue Light” photography exhibit is currently on display in the Mowry Alumni Center. Donaldson’s passion for photography is rooted in his travels as a child. His stepfather, a Chrysler engineer, was on the move frequently, and Donaldson grew fond of taking “basic” pictures along the way, “not really knowing what I was doing,” he admits. At Ohio Wesleyan, which did not offer photojournalism classes at the time, Donaldson enrolled in a photography class that he would not finish. With the only photography class available to him no longer an option, Donaldson shifted his studies to international studies, where he earned his bachelor’s degree, with minors in economics and history. After graduation, he headed to New York City to work in finance, but that certainly wasn’t his endgame. After living in New York City for eight years, Donaldson came to what he described as a watershed moment when he decided to move to Los Angeles. After a year-and-a-half of working in electronic sales in LA, he realized the opportunity in front of him to chase his dreams. Beginning in April 1993, he began three years of planning — physically, financially, and the trip itself — with Jan. 1, 1996, circled as the beginning of his journey across the globe. In total, the trip would take him across all six inhabited continents. Since then, Donaldson has published several photography books on the western New England region, where he now lives, and has contributed photographs to numerous other publications. He is currently working on authoring the book that will tell the story of his travels. Donaldson’s literal and figurative journey is one of overcoming adversity, something every person can relate to as they embark on their own journeys. 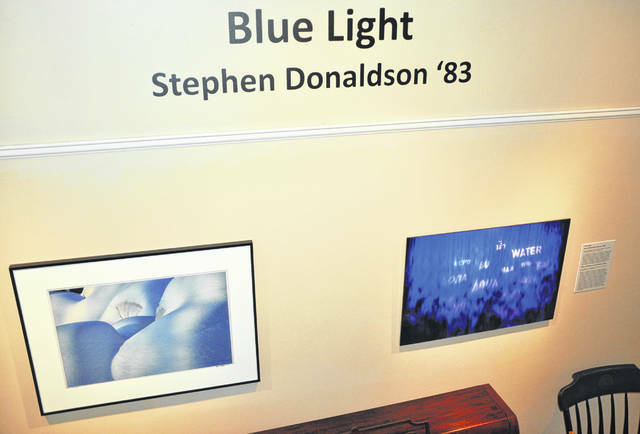 Of his “Blue Light” exhibit on display in the Mowry Alumni Center, Donaldson said he gained his inspiration from an interesting water-themed exhibit he and his wife came across while visiting the Museum of National History in New York City in 2008. He was able to capture a shot of the exhibit that featured a blue light shining through mist that began a new journey to put the collection together. There will be an open house at Mowry Alumni Center on Saturday, May 19, at 2:30 p.m. Donaldson will give a short presentation of his work, followed by a Q&A period.